I spotted this nicely rotten house on a visit to the antiques and flea market that takes place at the Vossenplein in Brussels (Belgium) every day. 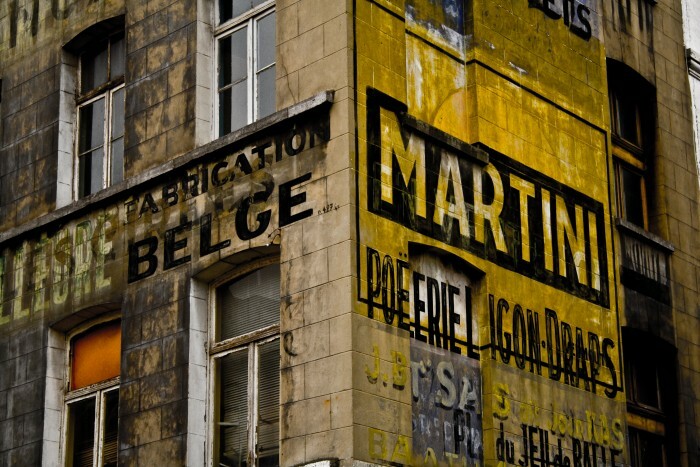 For decades, this antique market is deemed to be a must when visiting Brussels. Despite all the rubbish that is being sold there, I was happy to have found at least a nice house of which I could bring a picture back home. Interesting building, it looks like it went through quite a few businesses (MARTINI on one side and FABRICATION BELGE on the other don't go together!) - Nice colors, I should add.